Gary W. Melsher Tribute - Singerman, Mills, Desberg & Kauntz, Co., L.P.A. It is with great sadness that we remember our colleague, Gary W. Melsher, who joined us upon his retirement from Jones Day and was a member of the Singerman, Mills, Desberg & Kauntz Co., L.P.A. family for more than 13 years. Gary passed away suddenly on September 27, 2017. 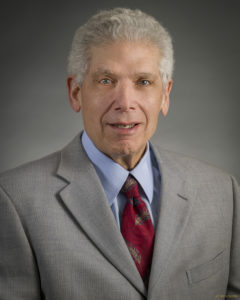 Gary attended The Ohio State University, where he was selected as a “Pacemaker”, and Case Western Reserve University School of Law, where he was an Associate Editor of the Law Review and a member of The Order of the Coif. Gary received many accolades in his professional career, some of which include being recognized by Ohio Super Lawyers Cincinnati Magazine and Best Lawyers in America. Gary’s practice consisted of representing landlords and tenants with a focus on shopping center leases. Gary was heavily involved in The International Council of Shopping Centers, and he was scheduled to speak this month at their US Shopping Center Law Conference. Gary and his wife Linda lived in Pepper Pike and raised three children — Chip, Bobby, and Jennifer. Although Gary was a devoted family man, he found time for his favorite past times. Gary was an avid golfer and passionate about gardening, especially dahlias. He was on the board of the Cleveland Pops and was a Browns season ticket holder since 1964. Gary will be missed, not only for his many gifts and talents, but also for his charm and infectious smile.